Tuesday is Tax Day! Go Cause trouble! The War Resisters League chart. 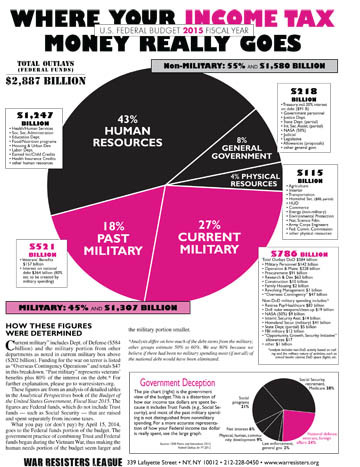 45% of what you hand the IRS on Tuesday will go for current or past war spending. It’s that time of year again. As I laid out last year, Tuesday is the day we all pay into the Federal tax system (most state income taxes are also due at this time, a subject for a different article). As usual, the New York Peace community will be out in force to remind us that 45% of what we’re writing the check for will be war spending. Groups such as National War Tax Resistance Coordinating Committee, War Resisters League of New York, Raging Grannies, Rude Mechanical Orchestra and others will converge at the IRS office at 110 W 44th Street (near Sixth Avenue) around 4 PM. Depending on timing, the assembled folks will march to the General Post Office at 34th Street, arriving there around or about 5:30 PM. This is all part of a Global Day of Action against Military Spending (GDAMS), which has a website here. I’ve laid out all the arguments about protesting the war tax before, so I’m not laying them out again–you can check out my earlier article, which explains what the protest is about. If you can drop by, do so. Remember–our ‘hope and change’ president is about to sign off on a trillion dollar modernization of the nuclear arsenal (the weapons themselves and their delivery systems). These are weapons that are illegal to use in any fashion. Remember (as I explain in my play HOW TO STOP THE EMPIRE WHILE KEEPING YOUR DAY JOB), tax resistance can bring some ugly consequences. Don’t assume that withholding taxes won’t be met with all the empire’s legal muscle. If this is a step you are ready for, you will need to find a support community. And if you can’t do this yourself, maybe you should be support community for someone who is ready. But if you’re in New York, show up on Tuesday for starters.